Thoughts of home have filled my last few days. Or perhaps I should say thoughts about the many homes I know. A video showing clips of movies filmed in Pittsburgh and a photo posted by my friend Mihee Kim-Kort about her family’s recent road trip, reminded me of the home where I grew: Neville Island. I realized that no matter how much I like New York, where I now live; no matter how much I like Louisville where I spent ten years and where I make many trips for work; no matter how much I like Cleveland Heights where Tricia lives now and we raised our family; no matter how much, and most days how much means a great deal, I will always, always, always bleed black and gold. But this week also saw our ministry host a group from First Presbyterian Church of Albuquerque, New Mexico. 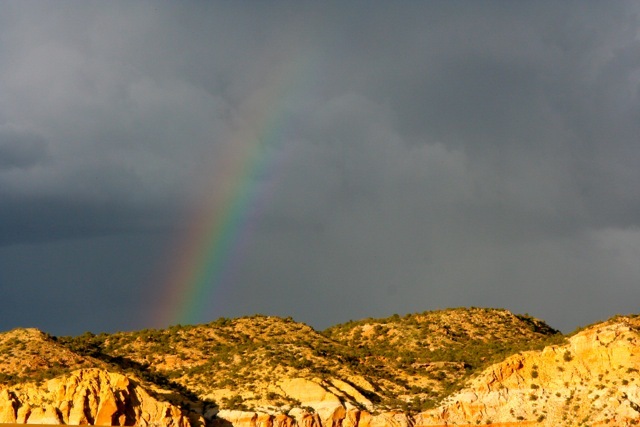 And in our conversations I found myself longing for Ghost Ranch and Northern New Mexico, the home of my soul, the place where, every time I visit, I know I belong in a way like I belong in no other place on the planet. All precious places. All blur together. 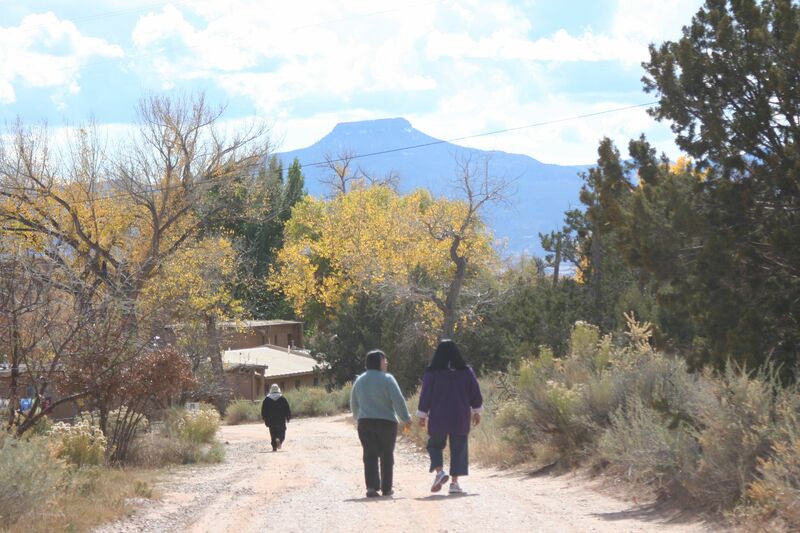 I give thanks for my homes and I pray and work for the day when all people have a safe place to call home. Why do I post photos of purple flowers? I have never liked flowers. In some ways, I dislike flowers. With my life-long allergies, many flowers flat-out make me sneeze. I also dislike taking care of flowers. Gardening holds no appeal. I can barely keep flowers or other plants alive indoors. When I moved to New York, I received a gorgeous potted setting of several plants for my office. Plants. No flowers. Those who gave it to me know of my allergies. The plants survive only because Ricky cares for them. I confess that I sometimes ponder getting cacti as a reminder of New Mexico. Someday I may do that. For now, even the minimal care that cacti require seems more than I want to expend. I do understand that others like to receive flowers. From time to time over the years, on what I hope were appropriate occasions, my mother and Tricia have received gifts from FTD. When he played a senior solo at Heights High, son Sean received many flowers from friends. I wonder at this concept and then rejoiced when he shared the flowers with shut-in friends. My lack of interest in things floral does not come naturally. My grandfather loved to garden. He did so at home and on the family farm. In retirement he worked at the local college – as a gardener. I spent time in gardens working with him. I carried tools I could not name and cans of water. But I learned little. My joy came not from caring for the flowers and shrubs and trees but from being in my grandfather’s presence. His love for gardening and for flowers passed to my mother. Again I helped but never quite got the point. No green thumbs came to me. I am fine with that. Sifting through the sands of memory, one floral experience does bring a smile. We lived for a number of years on Neville Island in the Ohio River – 7007 Front River Road. Why can I remember that but forget passwords I created yesterday? Between our back yard and the Ohio River stood an inclined bank where each spring wild flowers grew. I can still see my pudgy little hand proudly clutching bouquets for my mother – bouquets of wild violets – purple flowers. The color purple is easier. I have always liked purple. At one point, I persuaded my parents to paint my room a deep, dark, rich, royal purple. A few years back, I started taking photos. Sons Sean and Eric began before me and it looked like fun. 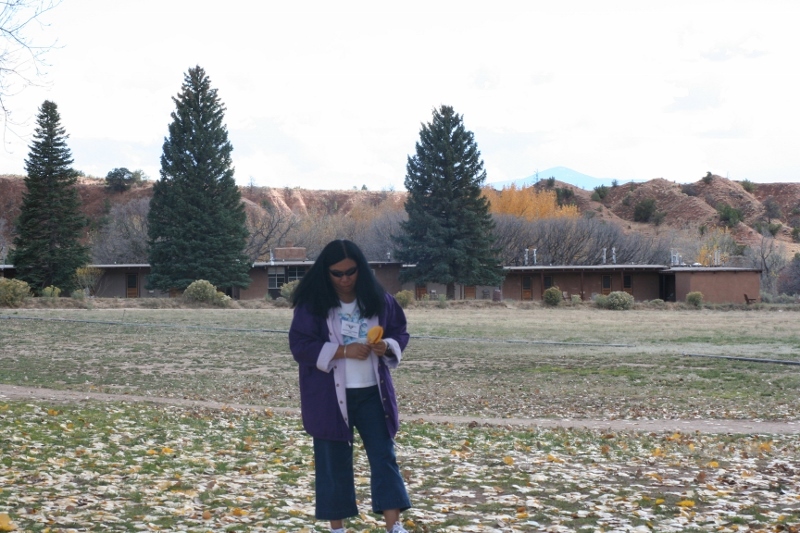 One summer, Sean loaned me his camera to take to Ghost Ranch. I was hooked. I started saving money and reached the goal. Then, a few days before I went shopping, the washing machine at the Shire died. I knew it was not a good sign when the repairwoman spent fifteen minutes in her truck trying to track down the part. She pointed out that the dryer was the same age as the washing machine so it might make sense to replace them both. Darned if that did not cost about the same as the camera I wanted to buy. I saved again. Time passed. The major appliances cooperated. I took the plunge. I am not any good at it. I freely confess that. But every once in a while the camera carries me. Foolish and fearless, I post some of the results. This spring I posted photos from Ireland and Northern Ireland where Tricia and I traveled for Roja and Joel’s wedding. Among the photos was one of purple flowers at the Titanic Memorial Garden. 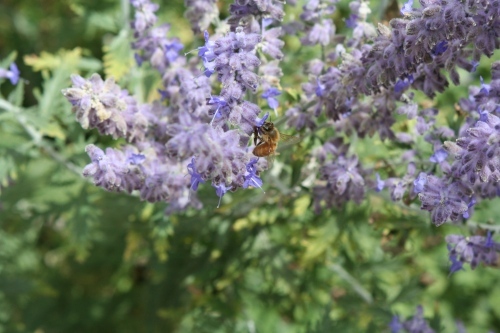 After that, as I sorted through my photos, I realized how many photos of purple flowers I have. I had not been aware of that. But there they are. And the series was born. 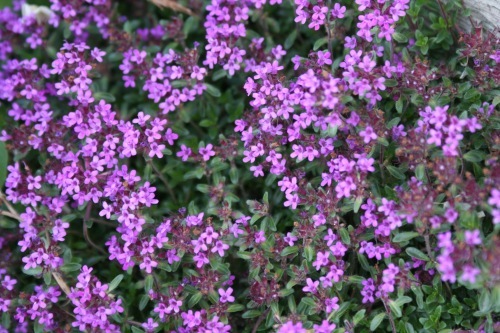 Now I take photos of purple flowers intentionally. I cannot name the flowers and have little interest in learning their names. But I know where I took the photos and with the aid of the time and date stamp when I took them. Perhaps they touch my childhood in some way I will some day understand. For now, they are purple. 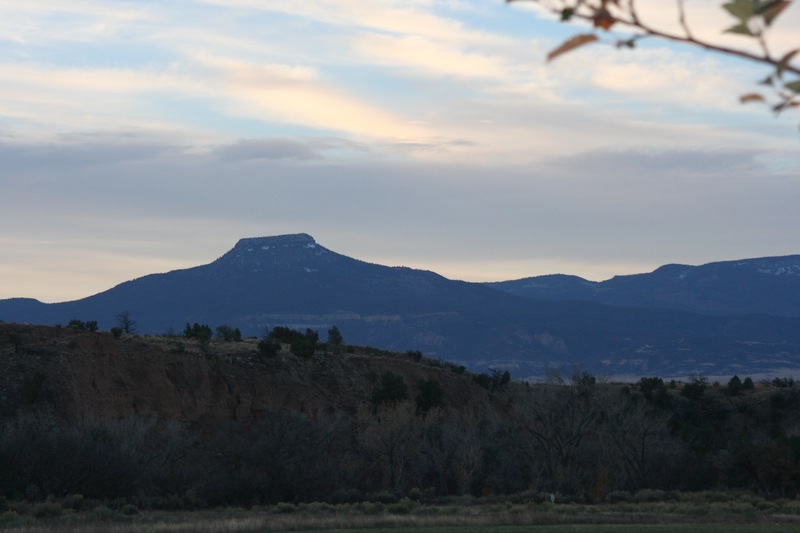 for another summer at Ghost Ranch.